Google has patented the idea of 'allocating tasks to a plurality of robotic devices.' I'm pretty sure I've seen this idea before. 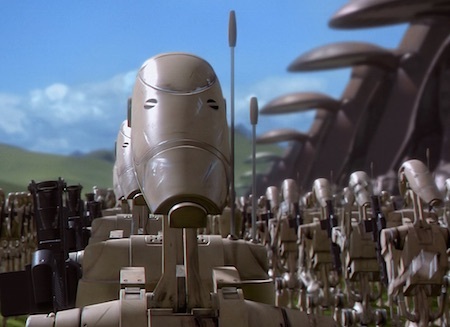 The largest droid army in galactic history (Star Wars history, that is) was the Separatist Droid Army created for the Confederacy of Independent Systems in the 1999 film Star Wars: The Phantom Menace. The entire army was controlled from orbit from one control panel. An example method includes receiving information associated with task logs for a plurality of robotic devices and in a computing system configured to access a processor and memory, determining information associated with a health level for the plurality of robotic devices based on the information associated with the task logs. A health level for a given robotic device may be proportional to a current level of ability to perform a function, which may change over a lifespan of the given robotic device. Information associated with a plurality of tasks to be performed by one or more or the robotic devices may also be determined. According to the method, the computing system may optimize an allocation of the plurality of tasks such that a high precision task may be allocated to a robotic device having a greater current health level than another robotic device. Via Systems and methods for allocating tasks to a plurality of robotic devices.